iOS 12 is finally here. And the update is packed with many improvements. In particular, Apple has tucked away many little features that you won’t see right away. If you want to impress all your friends with your mad iOS skills, here is a list of some of these features. I also wrote a review of iOS 12 if you want to learn more about all the changes coming with iOS 12. #1: Is it a phone? Is it a trackpad? Many people don’t know about this superpower, but you can move around an email or text message by turning your phone into a trackpad. On previous versions of iOS, you had to use 3D Touch. It is now much easier to access as you just needs to tap and hold on the space bar of the keyboard. Goodbye, Gboard! RIP, Touch ID. But Face ID is just getting started. Apple knows that you want to let your spouse or friend unlock your phone. Sure, you can always share your passcode. But it’s less secure and people always forget passcodes. Head over to Settings > Face ID & Passcode > Set Up an Alternate Appearance. Ta-da, second face acquired. If you don’t use Do Not Disturb because you always forget to turn it off, this is a thing of the past. You can now use 3D Touch in Control Center to turn on Do Not Disturb for an hour, until this evening (or the next morning), until the end of an event or until you leave a location. Don’t forget, it’s one of the most powerful tools when it comes to using your phone less. Even when you don’t have Do Not Disturb on, chances are you receive way too many notifications. On the lock screen, swipe on a notification to turn on “Deliver Quietly”. Notifications won’t make your phone buzz and will skip the lock screen altogether. The only way to view them is by manually pulling up the Notification Center. I already use it for most news apps as I don’t need to see the headlines right away. And everything feels quieter. If you want to be more like Jack Dorsey, go to Settings > Control Center > Customize and add “Hearing”. This feature called Live Listen lets you turn your AirPods into hearing aid devices. If you have a hard time listening to conversations in some crowded environment, this is an important feature. Apple has improved how password managers work on iOS 12. If you’re already using a third-party password manager, such as 1Password, LastPass or Secrets, your life is about to become so much easier. Head over to Settings > Passwords & Accounts > AutoFill Passwords. You’ll be able to log into websites and accounts using your data from your third-party password manager without having to open it. As for one-time codes, if you still rely on text messages (and you shouldn’t), iOS will scan your incoming text messages to automatically copy and paste your one-time codes. Neat! Yay, Memojis are here! Sure, you can record voice messages and send them in Messages. But don’t forget to take selfies with your Memoji. You can also drag and drop your Memoji on top of a photo or a message. Emojis are so 2017. 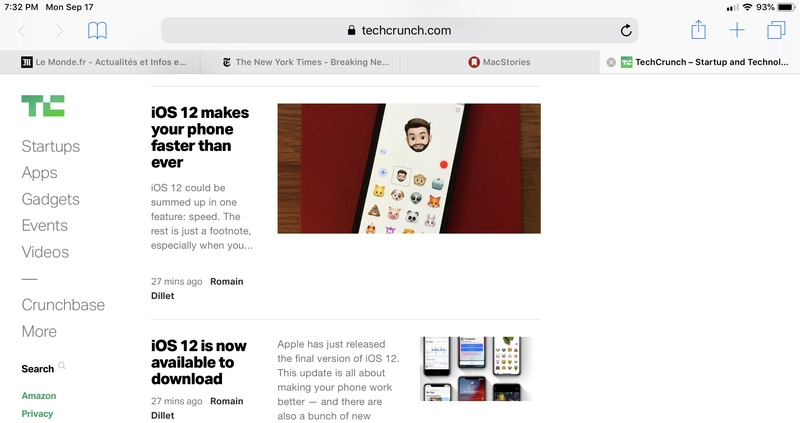 On your iPad, you can finally turn on favicons for browser tabs — those tiny little icons in the tab bar. This way, you’ll be able to find what you’re looking for much more easily. Head over to Settings > Safari. #10: Is it too late to say sorry? It’s so annoying when you keep hearing a song in your head but you can’t remember the name of the song. Maybe you just know that one line of the lyrics. You can now type those lyrics in Apple Music. The service now lets you search by lyrics. The most powerful feature of iOS 12 is clearly Siri Shortcuts. Combined with Apple’s Shortcuts app, you can trigger chains of actions with a simple phrase. The Shortcuts app is available for free in the App Store. Time to think about your own morning routine! I’ve been busy building some advanced examples for the Shortcuts app in iOS 12. My Morning Routine shortcut, plus many others, will be coming Monday alongside my iOS 12 review.